If you are looking for information on the Renew Softwash franchise business opportunity, Renew Softwash franchises or Renew Softwash franchising, then you have come to the right place. Our surface restoration system is an environmentally safe and effective cleaning method designed to restore the exterior of buildings to their original appearance. The process removes biological growth and pollutants from the surface. The system is very fast, thereby saving customers inconvenience, downtime, and money. 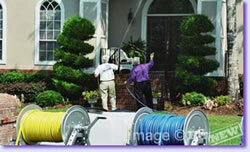 Until now, pressure washing has primarily been the method used in cleaning the exterior of buildings. There have been significant complaints about the damage to buildings as a result of cleaning with pressure. The ReNEW Softwash system uses virtually no pressure to apply our cleaning solution, ReNEW 754. Our product and system are responsible for the remarkably improved appearance of hundreds of buildings. Because of our process, your house will stay cleaner for much longer than if pressure washed and without causing damage. Exterior Cleaning: The ReNEW Softwash system gently removes algae, fungus, mildew, mold, pollen, dirt, grime, spider webs, and wasp nests from the exterior of your home using our unique chemical solution and very low pressure. Roof Cleaning: Cleaning your roof may reduce energy consumption, extend the service life of your shingles and also restore shingles to their original color! 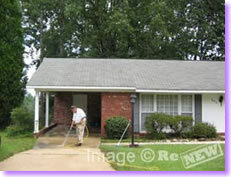 ReNEW has been in the exterior restoration business since 1998. Our product, ReNEW 754, has been proven to be the premier exterior cleaning product in the U.S., today. Our System, ReNEW Softwash, is truly, America's finest Softwash System. We have cleaned the largest office building in the United States, major collegiate sports venues, and numerous college and private-sector buildings. Our extensive knowledge of the cleaning business is passed on to our franchisees through classroom and hands-on training. If you are an individual who wants to own your own business, enjoys talking and dealing with people, and does not mind a little work, then ReNEW is the business for you.